Prepare a feast for the Lady of Decay. Investigate the desecration of the Hall of the Dead in Markarth. Clear Reachcliff Cave of undead. Bring a fresh kill to Namira's Shrine. Do the unthinkable for your reward. "What are you hiding, priest?" Markarth is the capital city of the Reach, a place of misfortune and decay, and the denizens rarely talk to strangers about anything but the endless problems with the natives of the Reach, the Forsworn. Fortunately, the innkeeper at the Silver-Blood Inn will happily share a few local rumors when asked, so enter the tavern near the main gate and find Kleppr behind the bar. One of the rumors may reveal problems with the local Hall of the Dead, which has been closed for unknown reasons. You are told to see Brother Verulus for further information, thus starting the objective that eventually leads to this quest. If Kleppr refuses to talk about the hall, you can find Brother Verulus yourself, who will openly tell you about current events. After the conversation, talk to Verulus and he will deny you access to the hall and will provide a standard explanation. You can attempt to bribe, persuade, or intimidate him, although only the first two options will get you anywhere. To succeed at bribery or persuasion, you will need to pass an easy Speech check. Would some coin help? (Bribe) Passed: Well, the Priesthood of Arkay always accepts generous donations. He will then explain the macabre situation in the hall and reveal the truth: "We've discovered that some of the dead have been... eaten. Flesh has been chewed off, bones were snapped to get at the marrow inside." Verulus then proceeds to ask you to investigate the Hall of the Dead and hands you the key to the hall. This is the beginning of the favor quest. Alternately, you can completely ignore Verulus and pick the lock to the hall. Entering the hall this way will trigger the main quest; however, unless you persuade or bribe him, you will not be able to befriend him using the favor quest. Moments after entering, a female voice will echo through the hall, saying, "Not many would walk blindly into a crypt, smelling of steel and blood, but not fear. I feel the hunger inside of you. Gnawing at you. You see the dead and your mouth grows wet. Your stomach growls. It's all right. I will not shun you for what you are. Stay. I will tell you everything you have forgotten." After the speech, Eola will then run up to you and continue in the same vein, trying to seduce you with suggestions and accusations. When she is finished, three options are available. If you choose the third option, the quest will immediately fail, as she will attack you, with no option to yield. You can still complete the favor quest and receive your reward from Verulus, but will never get to experience The Taste of Death. If you instead pick any of the two other options, Eola will continue her seductive behavior, eventually mentioning the Lady of Decay, Namira, and a so-called safe haven for cannibals like yourself. Regardless of your answer, the quest will start. If you ask her about the place, she will mark Reachcliff Cave on your map and reveal the truth about the desecration of the hall. Recently, the cave itself saw the dead rise from their graves, forcing Eola to flee and live in the hall and feast on its more passive inhabitants. She will task you with clearing the cave, and will then cast her invisibility spell, asking you to meet her at the cave entrance. She will also assure you that the hall will see no further disturbances, and will then leave. Go talk to Brother Verulus and tell him the good news. He will be quite happy, hand you his Amulet of Arkay as a reward and return to his duties inside the hall. This completes the favor quest. "Bring Verulus here. The Lady of Decay will do the rest." Reachcliff Cave is located east and slightly south of Markarth and can easily be reached by crossing the bridge to the south from Karthspire. As promised, Eola will be waiting for you near the entrance and will seek you out as you approach. She will reveal that the opposition inside the cave consists of draugr enemies and the whole cave has to be cleared. You can choose to have her as a follower, so decide whether or not to accept her offer and head inside. Watch out for the higher-leveled draugr in the second chamber and carefully proceed forward. 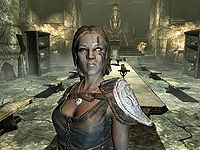 Eola is a powerful follower and will not hesitate to summon a flame atronach or revive defeated draugr for extra help. In the catacombs, take a left for a difficult jump to a chest on a small ledge. (Use Whirlwind Sprint for an effortless little zoom across the gap). 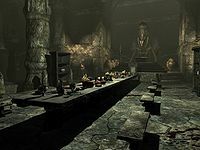 After a short trek, you will arrive in a room with several draugr, including the boss, so dispose of them all and take a look around; the chamber consists of a huge dinner table, and, in the southern end, the very altar of Namira. Eola will now approach and thank you for reclaiming the Shrine, and will ask you to bring in a fresh kill for your initiation into the coven, specifically a priest filled with the taste of the easy life, Brother Verulus. She will then hand you 100 gold to cover expenses and show you the way out. A shortcut to the outside world will now have opened in the room next to the Shrine, so exit the cave and travel to Markarth. Back in the Hall of the Dead, the unsuspecting priest has picked up his daily routines and spends most of his time sweeping or praying near the Shrine of Arkay, convinced that everything is all right. Talk to him and ask him for assistance during your travels. In order to get him to follow, you need to pass a speech check. As with the initial conversation with him about investigating the hall, only the first two options will get you anywhere. There would be treasure to share... (Persuade) Passed: Treasure, you say? I suppose the Jarl won't mind if I'm gone for a little while. Lead on. I'm willing to pay. (Bribe) Passed: That's no small amount of coin, friend. I suppose I can come with you for a short venture. Lead on. Leave the Hall of the Dead and fast travel to the secret back entrance to Reachcliff Cave. When you enter the dining hall, you will find several well-known Markarth citizens seated at the large table, all hungry and ready for the evening feast. The table will be set with beverages, bread, cheese and two pieces of human flesh. A confused Brother Verulus will approach the table, stuttering. Eola will immediately be over him and will use her seductive charms to make him forget where he is and feel incredibly tired. She will then proceed to invite him to take a rest on the altar in front of the Shrine of Namira, something he will do right away. Listening to the guests' private conversations makes it quite clear what they're all waiting for: the flesh of Verulus. Head to the altar where Eola will invite you to start carving the sleeping priest in front of you. At this point, you can choose to kill Eola, which will net you a leveled amount of gold from a grateful Brother Verulus and a fight against all the dinner guests, including the quest-related Lisbet, dog seller Banning and Markarth market merchant Hogni Red-Arm. Killing Eola will cause the quest to fail. Slay the sleeping priest in cold blood, which will make an excited Eola invite you to have the very first bite. Examine the dead priest and choose the option 'eat'. You will then be treated to an animation of yourself feasting on the still warm body of Verulus, and Namira will finally speak to you from her realm. "Mortal. I am Namira, the Lady of Decay. Your consumption of the blood and bile of Arkay's own is pleasing to me. I give you my ring. Wear it, and when you feast on the flesh of the dead I will grant you my power." You will then receive the Ring of Namira which increases your stamina by 50 points and allows you to feed on corpses for increased health and health regeneration of 50 points for 5 minutes (Note: If you are wearing the Ring of Namira and receive the Cursed Ring of Hircine from Sinding during the quest Ill Met By Moonlight, you will forever be able to feed off of bodies and obtain +50 health and +50% health regeneration). Eola will then welcome you to the coven and will be available as a follower should you ever need her. When all is said and done, leave the cannibals to their feast and head out into Skyrim. After killing Brother Verulus in Reachcliff Cave you are able to search his body and get back your earlier bribe. Though Namira makes no visible appearance, there is an unseen NPC in the cave who apparently acts as her voice. After completing the quest you can speak to the other guests, many of whom you might recognize from the market place in Markarth. If you meet the guests later, while they are at work, you can ask about the feast to which they will respond "Only the guests must know." You may also encounter Sigar in the wilderness, feasting on a fresh corpse. After goading Verulus into following you to the cave, he will become a follower and will follow you anywhere until you enter the cave. He is a decent battlemage, preferring to attack with frost and lightning spells from afar and don magic armor and a dagger in close quarters. He can be a formidable ally on many quests, so you might want to lay off eating him for a while. Unlike nearly all other quest followers, if you already have a follower when he joins you, he won't replace them. When wearing Namira's Ring, the guards may randomly mention your bad breath and ask you what you have been eating. If you attack any guest after completing the quest and receiving the Ring of Namira, Eola becomes aggressive (and if you took her as a follower, will leave your service and attack you). Killing Eola—even after quest completion—causes your journal to show all quest objectives as failed. This does not occur if Eola is killed as a sacrifice for Boethiah's Calling. If you choose to intentionally fail the Daedric quest while doing the favor quest, especially by killing Eola in the Hall of the Dead, Verulus will reward you with a leveled amount of gold and his thanks. If Thongvor is Jarl of the Reach before you enter Understone Keep for the first time, the argument between him and Verulus does not happen. This can happen if you have completed Season Unending or the Civil War quests (and sided with the Stormcloaks) before coming to Understone Keep. There is no change in Verulus' dialogue if you speak to him in this case. 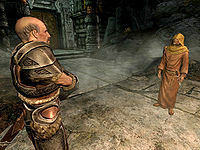 If you decide to save Brother Verulus, you can use a Calm spell on the other dinner guests after killing Eola to end the quest, but Banning and Hogni Red-Arm will never leave the feast to return to Markarth. Lisbet will return to Arnleif & Sons, but she and Imedhnain will be hostile towards you. Use another calm spell on them and leave the shop. Wait at least a day before returning and Lisbet will be friendly again, acting as though the feast had been successful. However, she will now try to murder any civilians who follow you into her shop so be careful not to start a conversation just before entering. If Eola dies sooner than intended, Brother Verulus may become glitched and will continually approach you for conversation whenever you enter the keep. If you have the miscellaneous objective to inform Verulus that you've cleared out the Hall of the Dead, be sure to speak to him about this first. Failure to do so can lead to him glitching and not following you. If you have Dawnguard installed, the game may crash every time you get near Reachcliff Cave. Use the player.moveto command to teleport in and out of the cave. Verulus may not be able to enter through the secret entrance, instead trying to take the long way around. You can use the player.moveto command to teleport you to him. If Eola somehow dies in Reachcliff Cave, the quest will end. Your target will no longer be there and the quest will disappear from your journal. There is no trace of you ever having the quest. The shortcut exit from the chamber next to the shrine in Reachcliff Cave may fail to open, requiring you to take the long way out. However, the shortcut may be open if you exit the cave via the main entrance and reenter it through the secret entrance. After Verulus has been killed, the option will still show to search him. Attempting to search him will present you with the "Leave." or "Eat." options. Choosing "Eat." will not show you feeding on Verulus, but the quest will continue anyway. Do not ask Kleppr if he's heard any rumors until Verulus has been informed the Hall of the Dead is safe if the quest was initiated by speaking to Verulus or "Speak to Brother Verulus about the Hall of the Dead" will be stuck in the Misc. quest category. 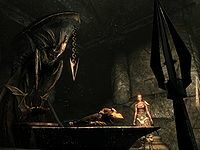 After killing Verulus on the Altar of Namira, he may clip through the table so it is impossible to feast on him. ? Saving the game and reloading will fix this. You can also use the Unrelenting Force shout to get the body out from inside the table. You can use the console command tcl to clip through the floor and reach his body. You may not be able to find Verulus and therefore cannot complete the quest. ? If Eola is asked to wait outside Reachcliff Cave, she will continually forcegreet the player. 60 Brother Verulus is dead, and I've been asked to feast on his dead body to complete my initiation into Namira's coven. 100 Finishes quest I have feasted on the body of Brother Verulus and have been rewarded with Namira's Ring. 250 Fails quest I killed Eola. Whatever she could have offered me was lost when she died. 500 Fails quest I killed Brother Verulus outside of the shrine of Namira's presence. The cannabilistic ritual to gain Namira's blessing has failed. DA11: 0, 5, 15, 45, 70, 200, 225, 600. On the PC, it is possible to use the console to advance through the quest by entering setstage DA11 stage, where stage is the number of the stage you wish to complete. It is not possible to un-complete (i.e. go back) quest stages, but it is possible to clear all stages of the quest using resetquest DA11.